The GIGABYTE BRIX was an ultra compact computer designed to be mounted on the back of a standard monitor via a VESA bracket. The idea was that you could turn any monitor or TV into a All-in-One computer. The issue was a lack of power/performance when it came to the original BRIX. 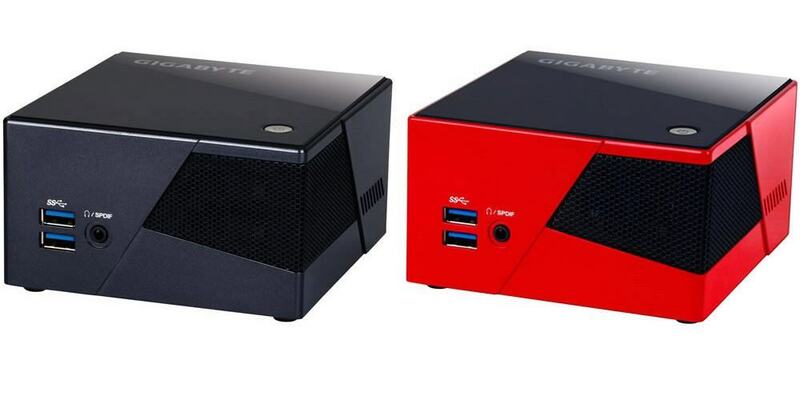 However, GIGABYTE's new BRIX Pro adds a little bulk in exchange for that much needed performance, and it is being shown off at CES 2014. Upgrade is the name of the game here with everything being brought up-to-date and beyond. The GIGABYTE BRIX Pro will be one of the first devices to have the Intel i7 Core 4770R with Iris Pro 5200 graphics. The Iris Pro features 64 MB of eRAM on-die to drastically reduce memory pipeline issues. This will give the new Intel i7 Core processors and the BRIX Pro more graphical power to run those demanding 3D games. You still get all the other goodies such as Wi-Fi 802.11ac/Bluetooth, two SO-DIMM slots, support for mSATA SSD and a standard 2.5" drive slot. This takes the whole DIY All-in-One desktop to a new level for me. While we still don't see anyone playing Battlefield 4 on high settings (or medium for that matter), this should be the perfect for less demanding games and daily computer work. Plus it now comes in this sports car red color with black trim (which looks awesome by Futurelooks standards), and is also the color of the the Core i5 version of the device, in case a Core i7 is overkill for what you had planned for it. We know at least one company has chosen to rebrand it into their very own Steam Machine. January 6, 2014 - GIGABYTE TECHNOLOGY Co. Ltd., a leading manufacturer of motherboards, graphics cards and PC systems, is proud to announce the next generation GIGABYTE BRIX Pro, a compact DIY PC kit that features professional CPU performance and visually stunning graphics support with the Intel® i7 Core™ 4770R processor featuring the Intel® Iris™ Pro graphics 5200. The BRIX Pro takes the signature compact design philosophy of the GIGABYTE BRIX series, adding a high-performance Intel® Core™ i7/i5 processor featuring Intel® Iris™ Pro graphics 5200. As well as a featuring a true high-performance processor that is ideally suited to CPU-intensive applications like image design and video editing, the superior graphics performance of the BRIX Pro means it’s also great for 3D gaming. Available in black and red, with a choice Intel® Core™ i7 4770R or Core™ i5 4570R processors respectively, the BRIX Pro is a DIY PC kit, shipping with a Wi-Fi Mini PCIe module pre-installed, plus power adapter and cable. The BRIX Pro gives users the flexibility to independently choose integrated storage and system memory sizes, with two SO-DIMM DD3L slots plus support for both mSATA SSD and standard 2.5” SSD installation. The BRIX Pro is one of the first devices to boast the cutting edge graphics capabilities of Intel® Iris™ Pro graphics. Based on the latest graphics architecture from Intel®, Iris™ Pro Graphics use an on-package 64M eDRAM cache that negates memory pipeline issues, greatly boosting overall performance in 3D applications. The GIGABYTE BRIX Pro features both Mini DisplayPort and HDMI ports on the rear panel, enabling support for simultaneous dual display connectivity, making it suited to both the work place, home theater and entertainment scenarios, including casual 3D gaming. The GIGABYTE BRIX Pro also supports the latest 4K displays via HDMI. Audio connectivity includes SPDIF audio via a front panel connector, useful in Home Theater scenarios that use an A/V receiver. The GIGABYTE BRIX Pro provides four USB 3.0 ports* (2x front plus 2x rear) offering improved connectivity for peripherals, storage devices and more. In addition to including a Gigabit Ethernet port, the GIGABYTE BRIX Pro also includes a Mini PCIe module offering 802.11 b/g/n/ac Wi-Fi and the latest Bluetooth 4.0, providing connectivity for low power Bluetooth devices and peripherals, as well as allowing users to easily connect their mobile devices. Bundled with a VESA bracket, the BRIX Pro can easily be mounted behind a monitor or HDTV making it discreetly hidden from view. This offers a simple and elegant way to turn any VESA-compliant display or TV into a full-featured PC or digital signage unit.